We offer an array of comprehensive services to help you get started and keep your systems up and running. Wyandotte, Michigan, emergency managers expressed grateful appreciation to Project Manager Tom Coviak (above) for his expert advice, when their primary station operator unexpectedly died. Over the phone, Coviak helped them quickly reinstate station operations. We can help you brainstorm ideas for your product application. Email Bill Baker for assistance (or phone 616.772.2300 x102). 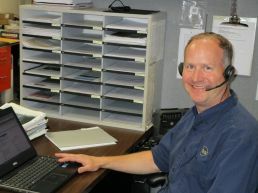 Bill can also provide formal system quotes and set up personal webinars to help you evaluate products and applications. If your station requires a FCC license, we provide everything you need to obtain it. Our services include a frequency search, filing of applications, tracking, notifications and any temporary licenses or changes that may be required. See this webpage for details. It's easy to learn the status of your project. Just email Tom Coviak (or call him at 616.772.2300 x104). He will provide planning and timeline details for your system's production, shipping, installation and training throughout the project's duration. Whether you propose a turnkey project or shared installation assistance, we are at your disposal. We can even provide an equipment package that you install yourself with instructions. See our Installation Services webpage. Provided with installation of your station is operator and maintenance training. And, you can schedule subsequent onsite (or online) training at your convenience. Once you are on the air, we provide online news and technical tips continually. We supply a one-year equipment warranty on all products, services and workmanship. The warranty is extendable to any term you desire. Broadcast recordings that are general in nature are free, if you are a member of AAIRO (join at www.AAIRO.org). You can also ask us to help you with event-related bulletin boards, seasonal or scenario-based messages for a nominal fee. Listen to the professional voices you can select to record your broadcast messages at our Recording Services webpage. Geoff Penna is your contact for repairs, replacements and upgrades. Email Geoff (or call him at 616.772.2300 x106). Geoff also manages EventCAST services for temporary applications, signal testing or special events. We support every product remotely (via telephone call, email, etc.) during the entire time that you own and operate it. Call 616.772.2300 and press 5, between 9:00 am and 5:00 pm Eastern Time. After hours, press 8 to page a technician. Send an email message to us, 24 hours a day. You will receive a response promptly. For assistance with computer-based audio control systems, call 616.772.2300 and press 5 between the hours of 9:00 am and 5:00 pm Eastern Time to set up an appointment for one of our technicians work with you online.